While shuffling through my RSS favorites recently, I ran across a post positing a hypothetical reboot of the fifty states into areas with equal representation in the Electoral College. The article is here, but I want to pay particular attention to my locale, and why I like the imaginary boundary better than the real one. 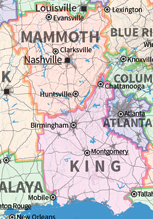 In this repartitioning of state lines, my area falls in a new state named “Mammoth”, taking its new name from the Mammoth Cave in Kentucky. Mammoth takes in Evansville, IN as its northernmost prominent city, Huntsville, AL, as its southernmost prominent city, and Nashville as its capital. It encompasses portions of the Ohio and Tennessee rivers. Mammoth bears some resemblance to the western third of the old Cherokee Nation, as displayed in C.C. Royce’s map from 1884. So what is better about these new borders? It aligns Huntsville and Nashville more naturally into the same state. The Tennessee River Valley in Alabama shares a closer affinity (in my lay opinion) to the Cumberland River Valley than it does with the rest of Alabama. Montgomery is too far away, both geographically and economically, from Huntsville. Also, the Mammoth boundaries create a state with a strong defense industry nestled inside. Huntsville has Redstone Arsenal and Marshall Space Flight Center. Clarksville has Fort Campbell. Coinciding with this is a swath of excellent universities including the University of Alabama at Huntsville, Vanderbilt University, and the University of Southern Indiana, not to mention several smaller colleges in each of the cities. One downside of Mammoth, however is that there are no Amtrak stations within its borders, but I suppose that only matters to the few odd folks such as myself who still enjoy travel by rail. To a greater extent, my bias is based on a greater affinity I have for Nashville than I do for Birmingham or Montgomery. I’m a boring fuddy-duddy, but I do enjoy a nice stroll in downtown Nashville with all its venues, and the occasional “rasslin” event at the Bridgestone Arena. Given my Cherokee heritage, I’m not an Andrew Jackson fan by any means, but the Hermitage is an amazing house to visit as well. Closer to home, I especially enjoy the the Constitution Hall Village in downtown Huntsville or the Harmony Park Safari Drive-Thru Zoo. There’s also Old McDonald’s Petting Farm, which is a bit out of the way, but fun for small kids. To the north of Nashville there’s the National Corvette Museum and the Kentucky Bourbon Trail. I’m not knocking any of the states that would be redefined. They each have their own wonderful histories, but borders are made to be redefined. If we’re evaluating hypotheticals, Mammoth seems to capture a regional culture pretty well.